You’re putting clothes away, and baby’s pulling them out faster than they go in. Then you clean the windows – as junior blows bubbles on the glass. Always on the part you have already scrubbed crystal clear. Sound familiar? Your house will never be completely tidy, dirt is a baby magnet and every task will take at least three times longer than it should – these are the universal truths of having children in the house. If anyone ever so much as hints that being at home with a baby is a doddle, show them this video. Created by Thad and Esther Anderson – the same clever couple who showed us ways to escape a sleeping baby – it perfectly depicts the part-funny, part-frustrating juggle of parenthood and running a household. Hilarious, right? The video is one of many posted on the couple’s website, Story of This Life. And I’m willing to bet this one in particular is the story of most parents’ lives! 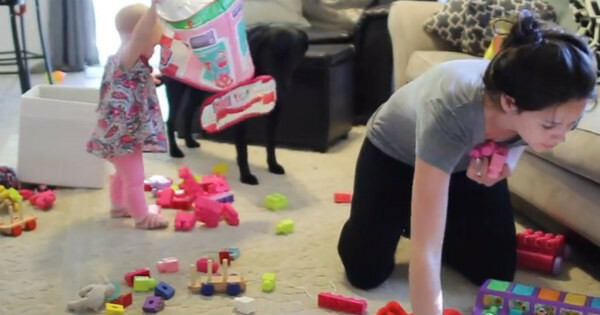 Which chore do you find most difficult with a little one at your feet?